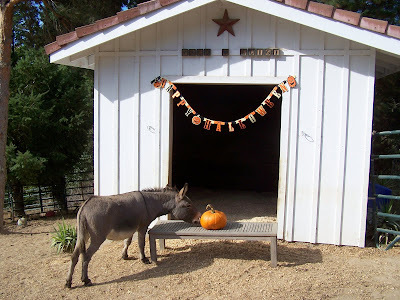 ~ THE LAZY VEGAN ~ HOME OF PACO & LUIGI AND FRIENDS: Happy Halloween at the Lazy Vegan! 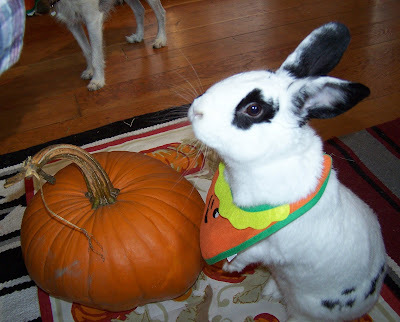 Weegie gets into the SPIRIT of the holiday! Happy Halloween at the Lazy Vegan! 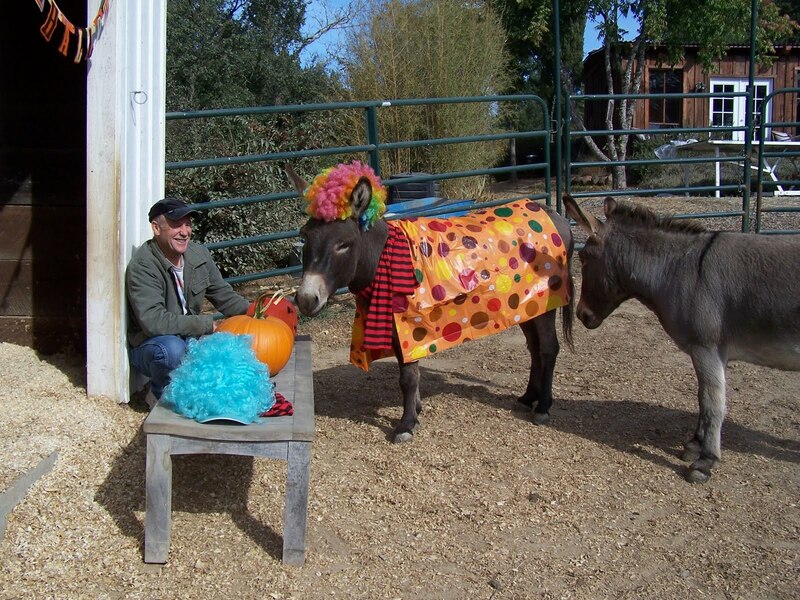 The animals spent the past few weeks gearing up for the holiday by trying on costumes before picking their favorites. 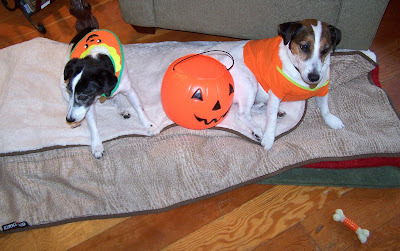 Actually, they had no say in the matter but all were extremely good sports about dressing up...except for Luigi, who refused to even momentarily don a wig...but no matter - he made up for it with a great lip curl! 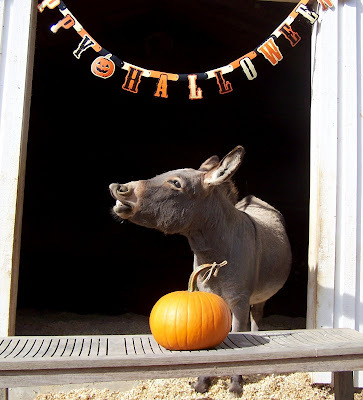 Happy Halloween and BOO to YOU from all of us at the Lazy Vegan! 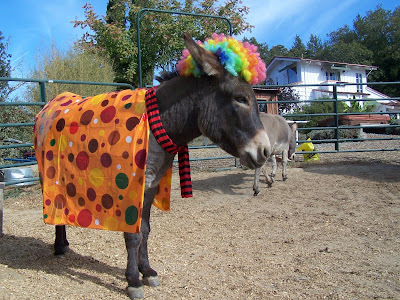 Paco the clown! 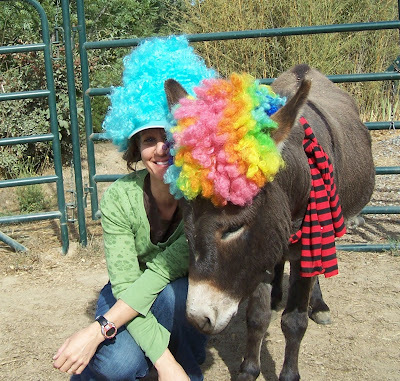 What an incredibly patient donkey...he let me try different wigs on him (thanks to Grandma Snap for loaning her wig collection!). 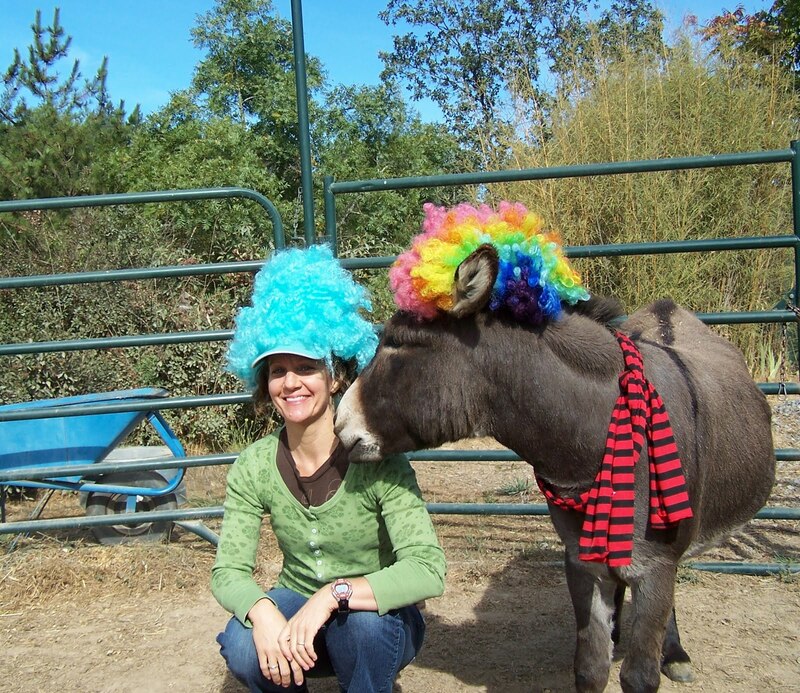 In my "Thing One and Thing Two" wig with Paco the clown. Yes, it is true...the foreman kisses clowns. 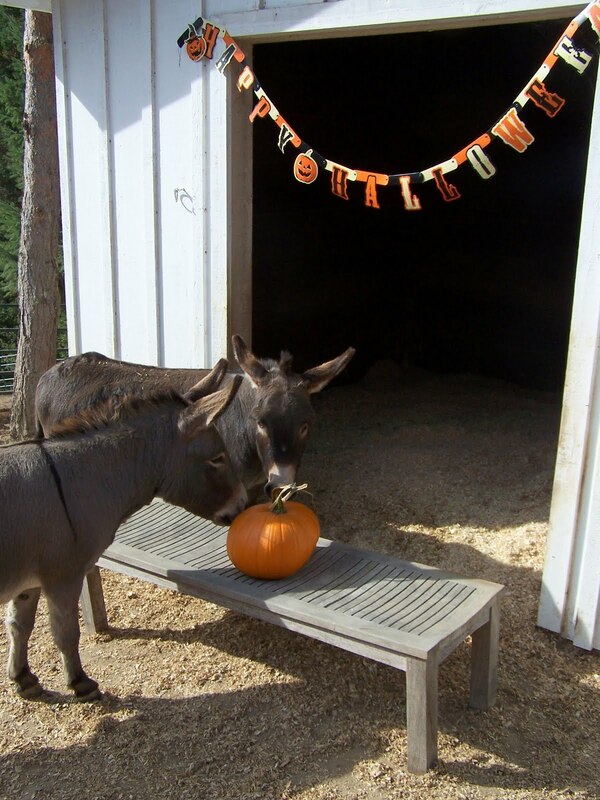 And donkeys. 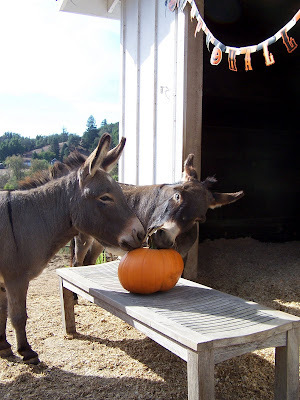 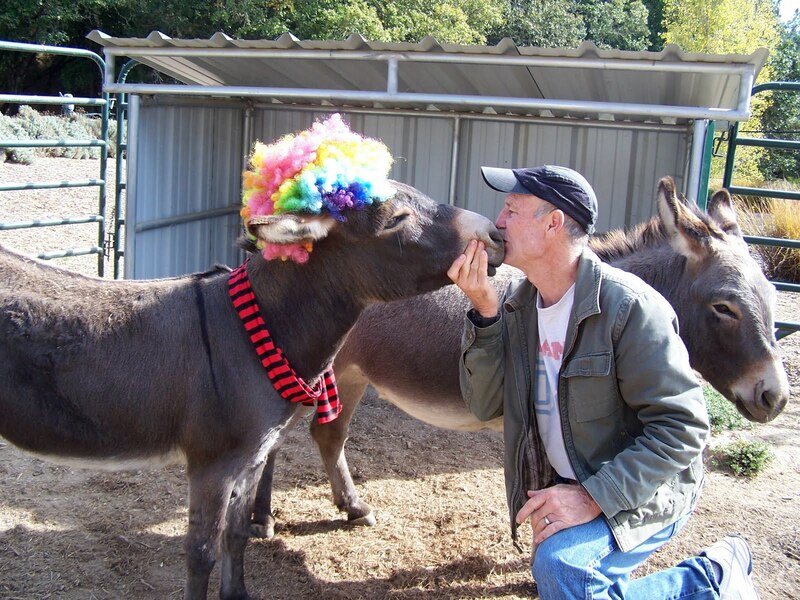 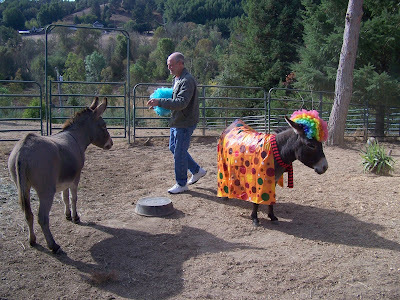 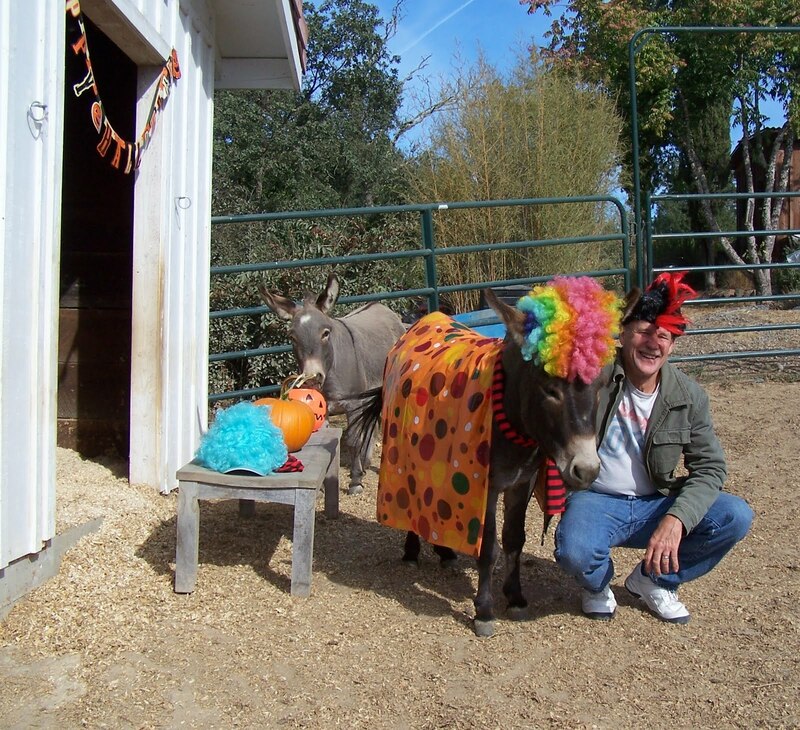 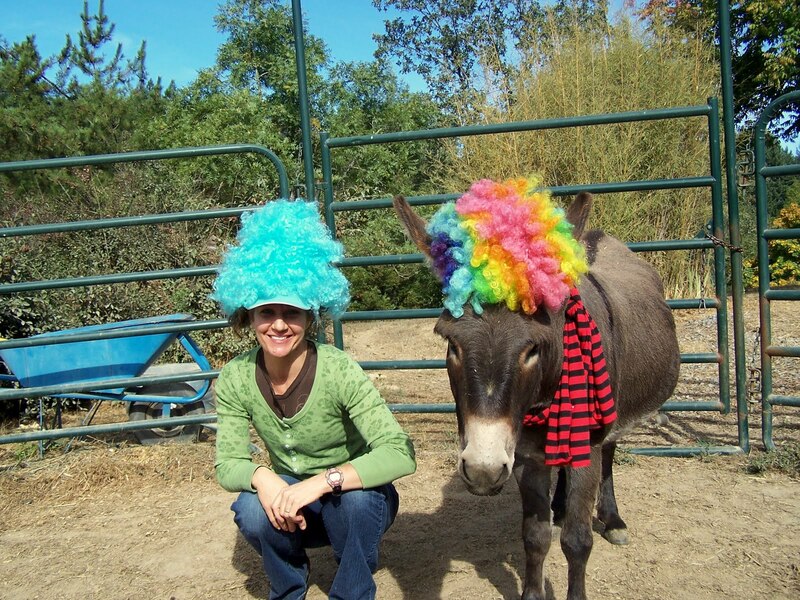 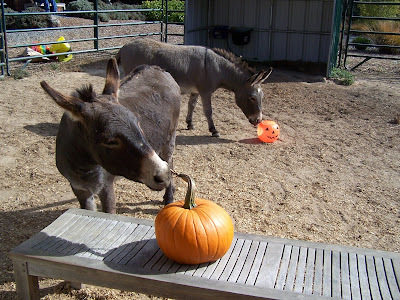 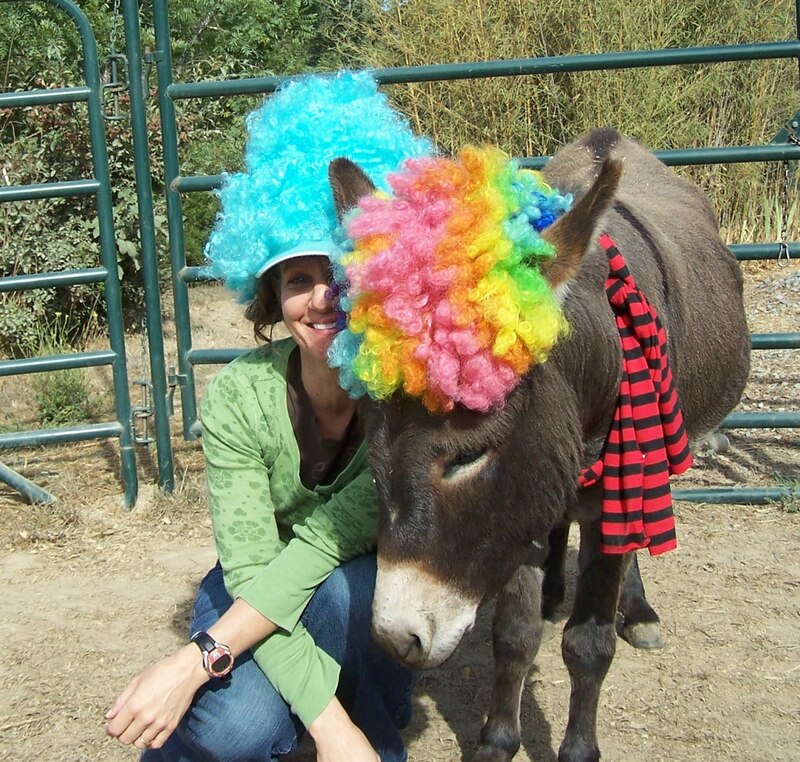 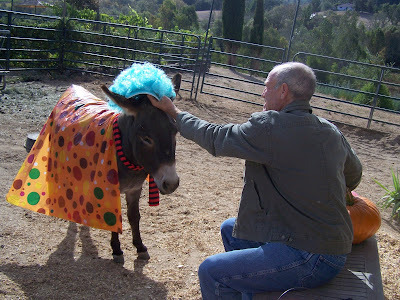 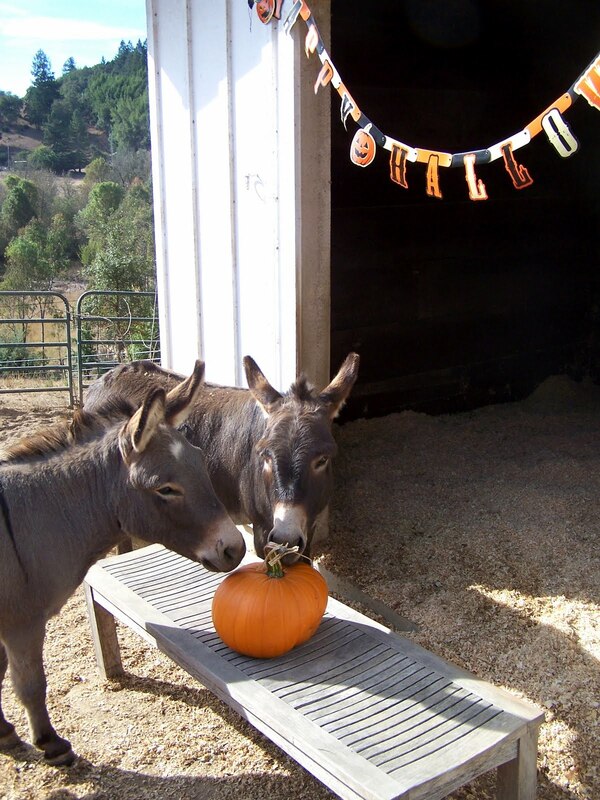 Sometimes I think I must be the luckiest person alive to have two donkeys in my life to dress up for Halloween! 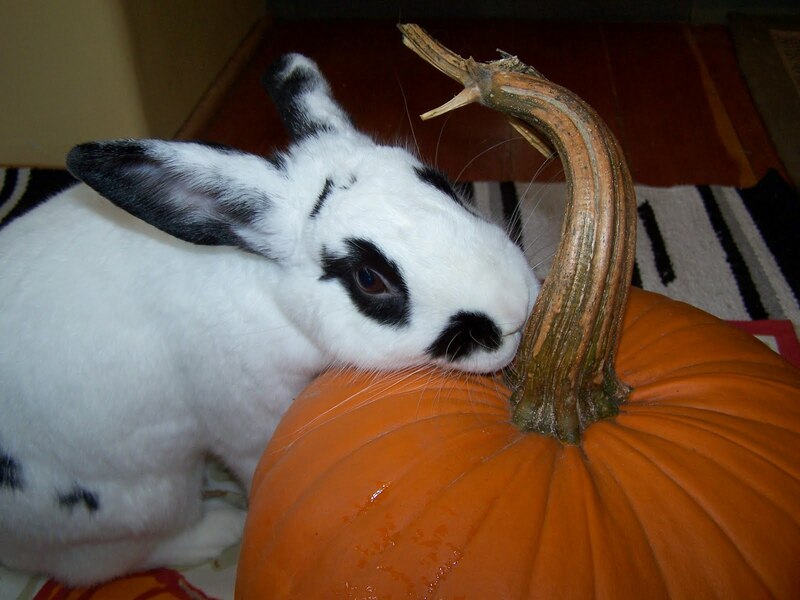 Paco really loves this stuff. 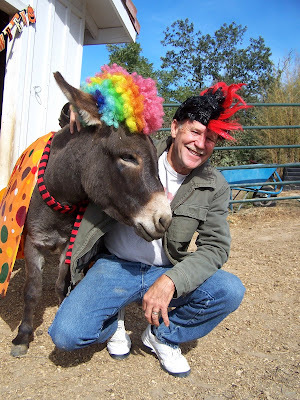 Weegie took one look at the foreman headed to him with a wig and spun on his donkey heels to head off in the opposite direction! Still, you'll notice that Luigi wanted to be part of the action! The foreman in a punk rocker wig with Paco the clown. 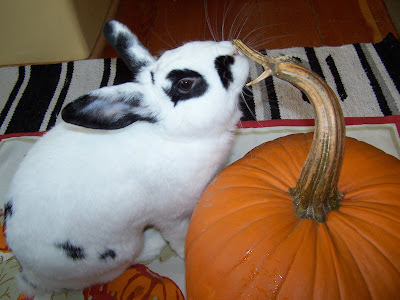 Wasabi went crazy over the real pumpkin! 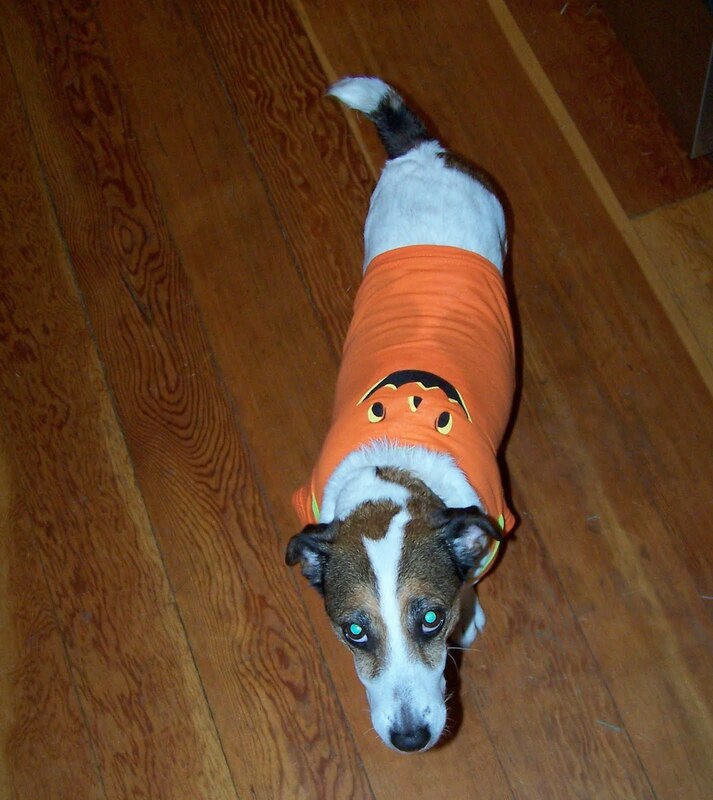 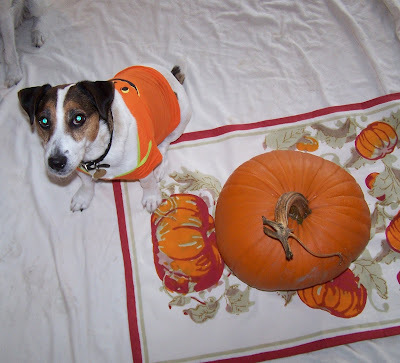 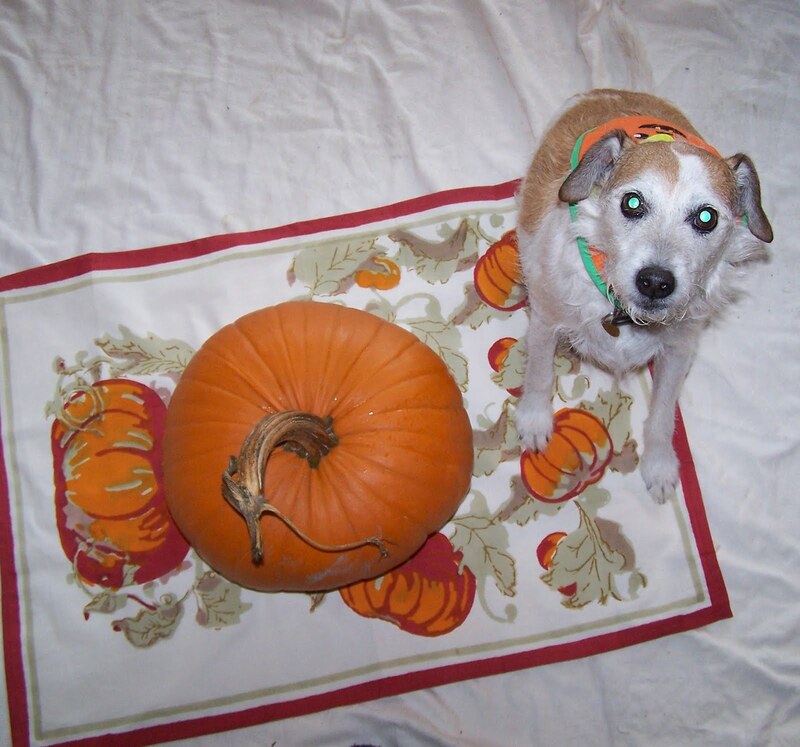 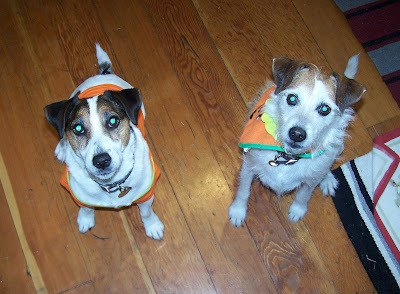 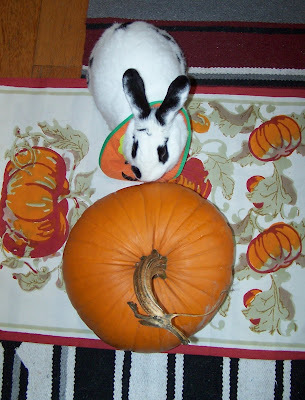 By golly...Wasabi was a pumpkin, too! 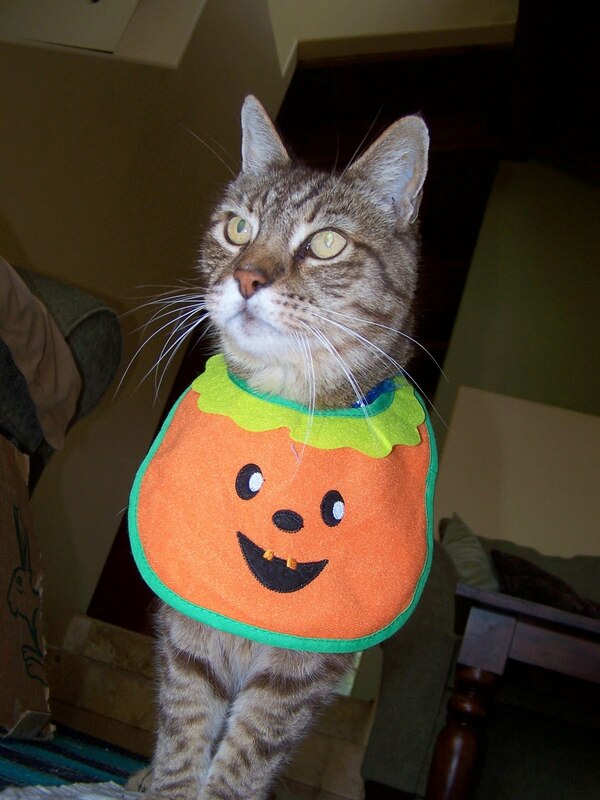 One little fifty cent pumpkin baby bib goes a long ways! 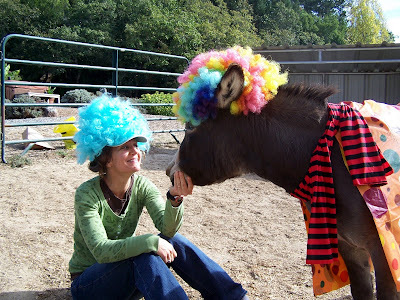 What??? Bravo also a pumpkin...although the little t-shirt barely fit him. 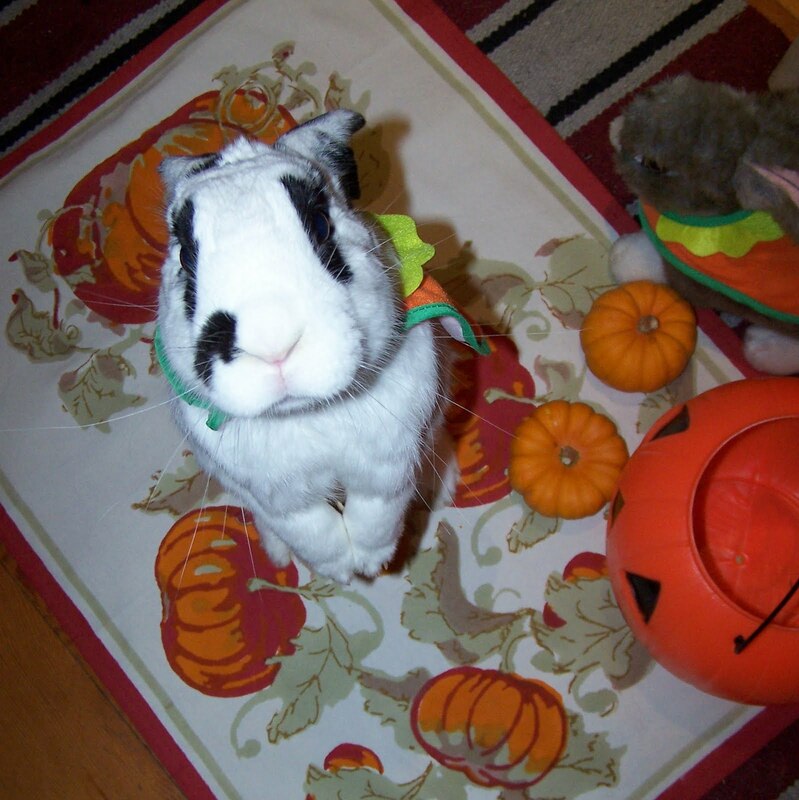 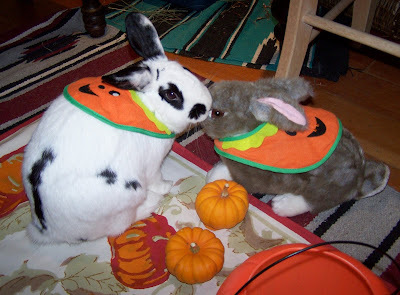 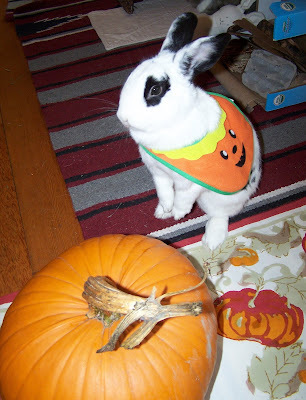 The little pumpkin rabbit investigator. I'm sure she thought the pumpkin was a giant treat for her! Practicing her "trick" part of treat or treating...begging for a treat! 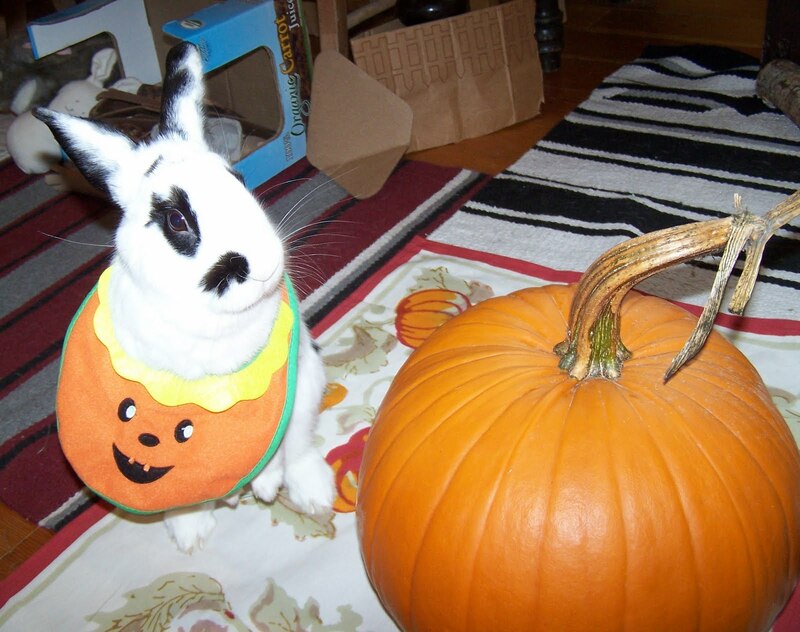 Pumpkin costumes everywhere. 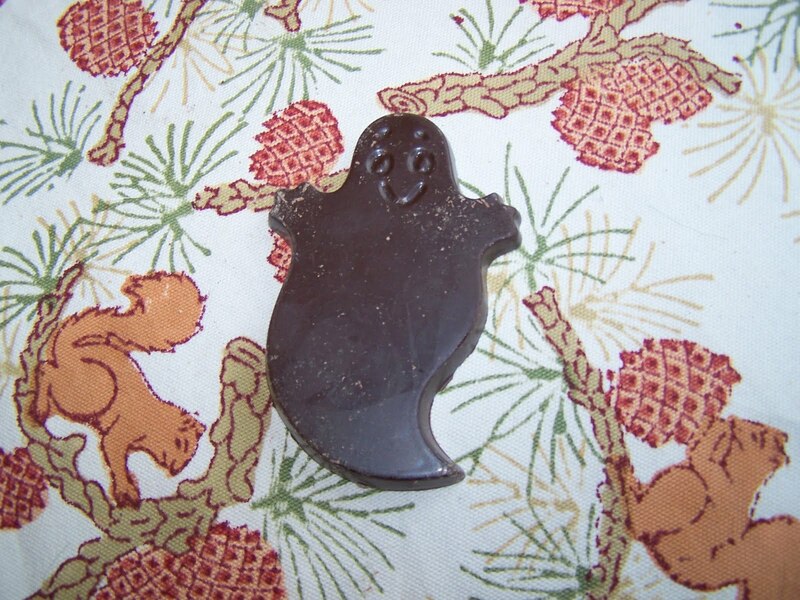 Maybe next year everyone will go as ghosts. 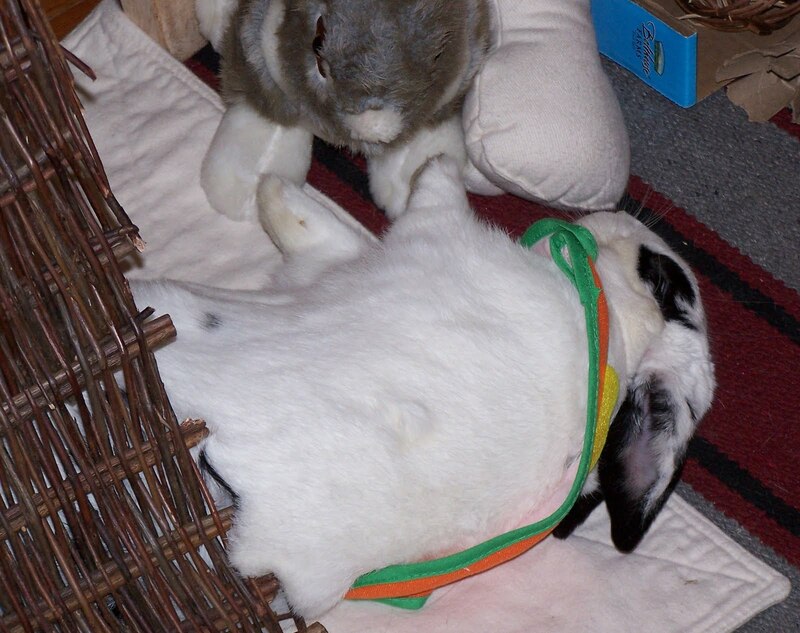 Wasabi was having so much fun that in the midst of it all she had to hop over and do one of her dramatic flop-overs. Such a drama queen!!! 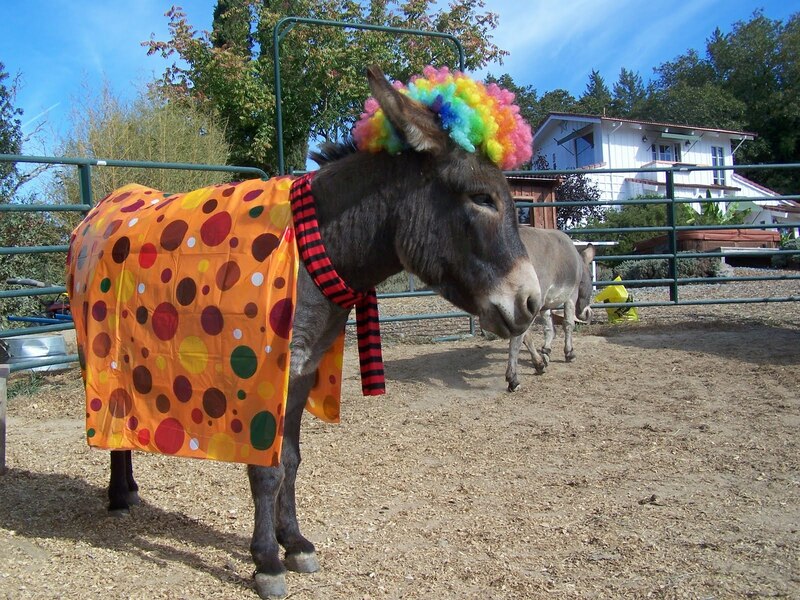 That's what she should have gone as! You can see that the pumpkin shirt is a wee bit TIGHT. My "formal" Halloween posed photos. 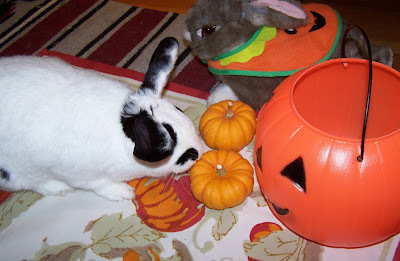 Solo was a bit intrigued by the plastic pumpkin. 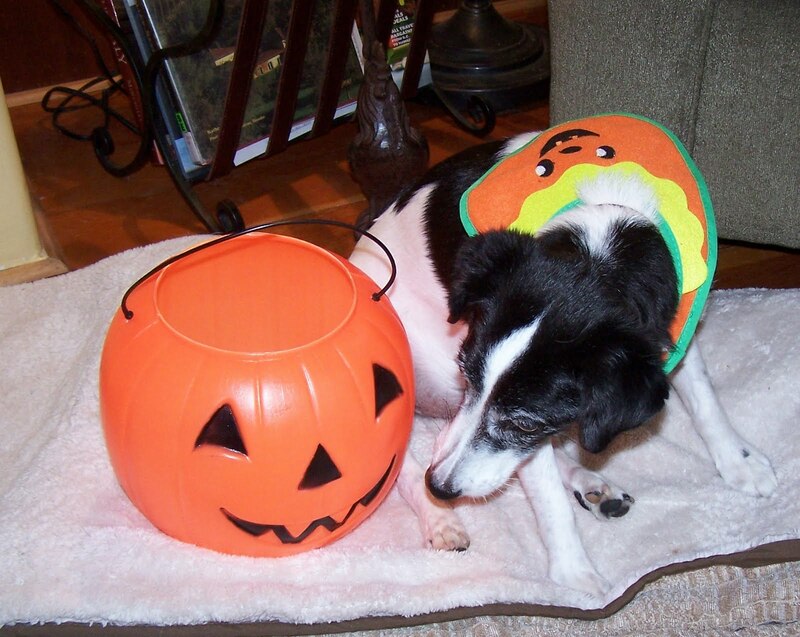 Bravo's a bit depressed that the treat part of the event hasn't yet transpired! 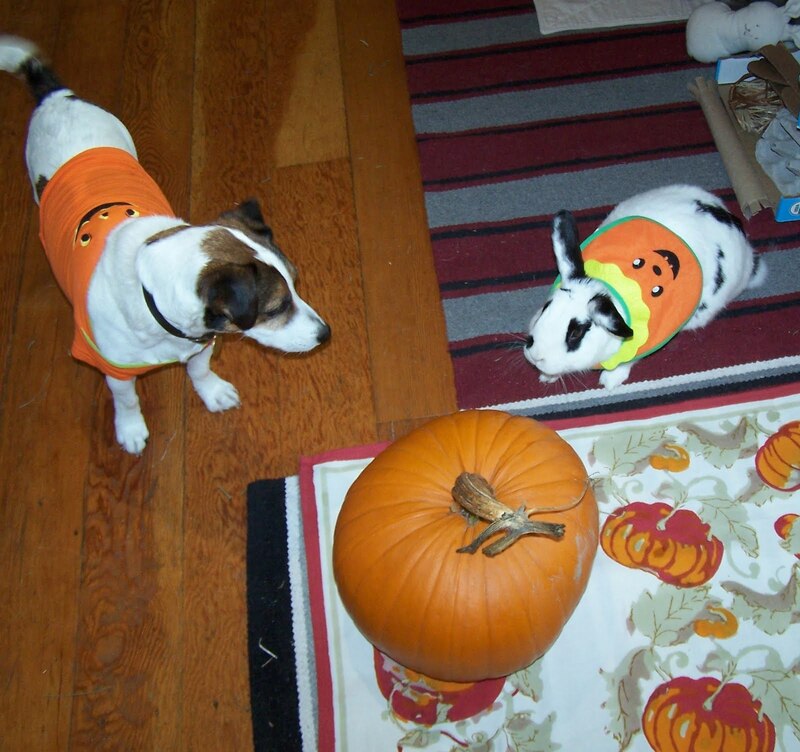 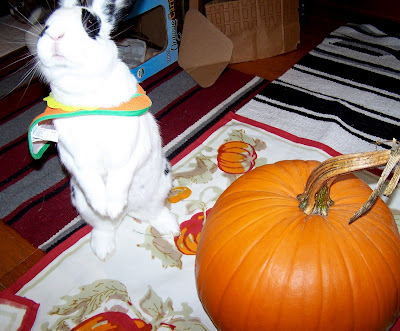 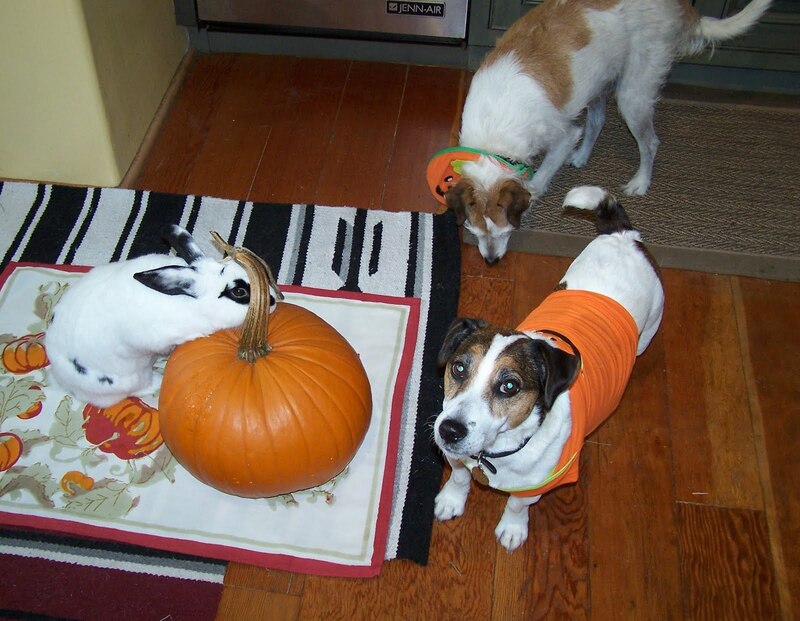 The perfect begging pose by the pumpkin bunny - what a TRICK for a TREAT!! Of course Buddy also had a pumpkin costume! 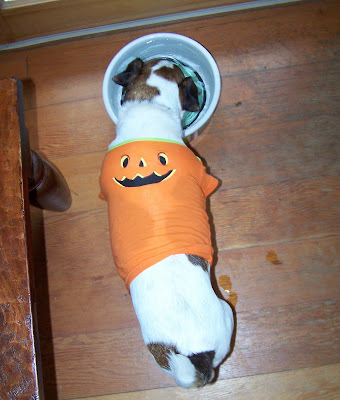 The pumpkin shirt proved what we've been suspecting: Bravo needs to go on a diet!